Problem: I cannot simulate an Apple watch interface. Whenever I try and test my Apple watch app on the iPhone 6 simulator, Xcode successfully finishes and builds the app, attempts at opening simulator and fails with an error message which reads 'Invalid Device State'. I believe simulator has a watch simulator that opens along with the compatible iPhone simulator models that can communicate with Apple watch (example: iPhone 6) Although I have yet to see it work. I have built a universal interface for iPad and iPhone and another for the watch, so it's not a matter of the app being for the wrong device. Whenever I test on my actual iPhone I can test the universal interface successfully. I have tried restarting Xcode/Computer. I can't seem to find any other mention of 'Invalid Device State' anywhere, hopefully due to it being an obvious thing to avoid/fix that I've overlooked. Any help would be appreciated. 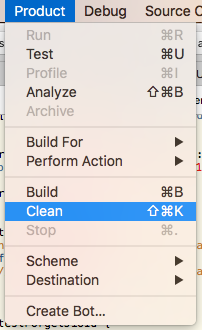 Force Quit xCode and restart will resolve problem. I had the same issue. Generally it is because you just update Xcode or change its name in the Applications folder. If you just restart your computer it will work correctly. I observed this happening when more than one Xcode app installed. Quit Xcode and relaunch it. First of all, just clean the project. This happens to me when I have two different xcode versions running at the same time. Hopefully this helps you. No need to quit, restart or even re-install. Switch to another iOS Simulator device (6s if you were using 6s plus) and voila! Nothing worked for me on XCode 7.3.1. Had to reinstall it to make the simulator work. Go to applications folder. Drag drop XCode to Dustbin. Run XCode. The simulator should work now. I have Xcode 7.3 and Xcode 8.0 Installed. If a am working with Xcode7.3 and opens Xcode8.0 to get some code from Xcode8.0 project. When i run my application on Xcode7.3 So it will give me same error. Solution is simple ForceQuit or Quit all Xcode's and open the required one. In my case, the simulator would show an indefinite black screen whether attempting to run a project, or running the simulator directly (which should bring you to the simulated home screen). This would happen even on a newly created simulated device. Reinstall XCode from the app store. This requires attempting to run XCode again so that Mac OS will realize it's no longer installed. Jus clean the project and restart Xcode. This happens to me when I have two diffent xcode versions running at the same time. Robust fix is Just Quit your xcode and run again, hope so it will help you. This heck work for me. Not the answer you're looking for? Browse other questions tagged ios xcode ios-simulator apple-watch xcode-6.2 or ask your own question.